Alvaro Tamarit was born in Alicante, Spain in 1976. Working thoroughly searching amongst objects that ceased to have function and that were stranded, Alvaro Tamarit found in nature itself the fragments of wood that form part of his works. In both his sculpture and collages, he demonstrates through series of pieces in which recycling is part of the creative process, developing his pieces worked through constructive processes such as formwork, assembly and gluing paper, photography, wood and recovered books. 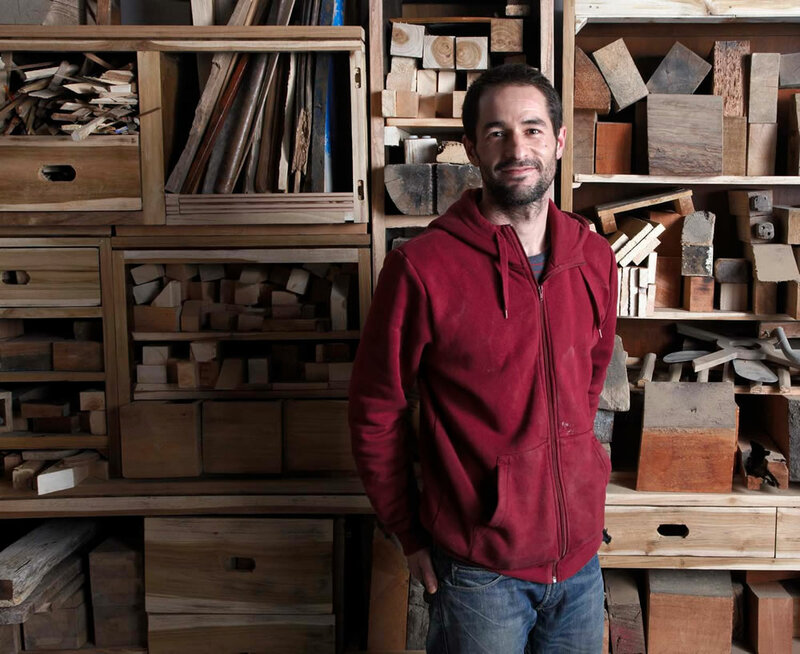 Since 2006, he has been creating furniture and design pieces, a series called Deconstruction, conceived from the use of reclaimed wood from which functional sculptures, unique works and commissioned pieces are made. One of the assumptions that has remained throughout his career, has been that art has to be close and understandable not only by adults but equally by children. Therefore, since 1999 his artistic exhibitions have been accompanied by learning experiences and the development of educational workshops. Álvaro Tamarit graduated from the Faculty of Fine Arts of San Carlos in Valencia. He studied the final year 2002-03 with Seneca Scholarship in the Faculty of Fine Arts of Cuenca. In 2003, he obtained a Visual Arts Scholarship for artistic creation from the Consorci de Museus de Valencia. Since 1999 he has received several awards in competitions nationally and in 2006 won First Prize Bancaja for Sculpture (XXXIII edition), with one of the pieces that forms part of the Deconstructions of Wood series, in which the sculptor has been working for some years. In 2007, he was awarded the First Prize for Sculpture at the Art Contest IX Manolo Valdés, Altura Town Council, Castellón and in 2008 the First Prize for Painting in the Painting Contest “Salvador Soria”, Vila de Benissa. Alicante. More recently, in 2011 was a finalist in the Saatchi Gallery Showdown 5 Saatchionline competition. His work has been exhibited individually in numerous galleries in Spain, Germany and Holland, also part of group exhibitions in Cuba, France, Brussels, China, Taiwan, Canada and the UK. His work forms part of the art collections of The Bancaja Foundation, Museums Consortium Valencia, Talens Foundation Spain, the Department for Culture at the University of Alicante and The National Academy of “San Alejandro” Bellas Artes in Havana , Cuba. Pieces are also present in the art collections of the Town Councils of Alicante, Benissa, Javea, Aspe and Sagunto. He currently lives and works between Cornwall, UK and Jávea, Spain.